What a great way to celebrate our 25th wedding anniversary! The guides were great, as were the friendships we developed with our fellow travelers. 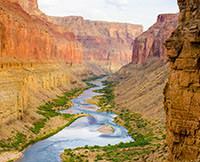 We hiked the Grand Canyon previously, but the view from the river was just a totally different perspective. Every view was camera worthy. The whole experience was great and I would recommend it to anyone with a sense of adventure. Thanks again for a super trip and anniversary.